Drinking green tea is one of the easiest and the most effective ways to hack acne out of your life. Getting over acne comes down to managing inflammatory damage in the skin. Inflammatory damage to the fatty acids in sebum triggers the acne formation process, as explained here. Consequently, reducing inflammatory damage to the skin massively improves acne, and there’s good evidence to show this is true. Earlier I’ve written how drinking green tea can reduce systemic inflammation and thus indirectly help the skin (by sparing antioxidants that can be used to protect the skin). Now there’s new evidence to show antioxidants in tea actually make it to the skin and provide direct protection against acne-causing inflammatory damage. So go grab a cup of green tea that’s been hacked for maximum antioxidant content and bioavailability and sit back as I explain how it’s going to protect your skin. Rhodes et al. showed that 12 week supplementation with green tea catechins (catechins are the antioxidants found in tea) provided significant protection against UV-induced inflammatory damage. This study included 12 Caucasian participants in the UK. For each participant the researchers measured what’s known as minimum erythema dose (MED), which is the minimum dose of UV radiation ‘producing visually discernible reddening of the skin’. Then the researchers ‘nuked’ each participant’s skin with 3 times the MED dose to measure the inflammatory damage to the skin. This was done on a small part of the buttocks. Once these baseline measurements were done, the participants were given a daily supplement that contained 450 mg green tea extract and 50 mg vitamin C. The supplements were taken for 12 weeks, after which the above measurements were repeated. This graph shows the difference in erythema (reddening of skin) pre and post supplementation. The D30 is the MED dose and 68 mJ/cm2 represents the maximum UV dose. Source: Oral green tea catechin metabolites are incorporated into human skin and protect against UV radiation-induced cutaneous inflammation in association with reduced production of pro-inflammatory eicosanoid 12-hydroxyeicosatetraenoic acid. 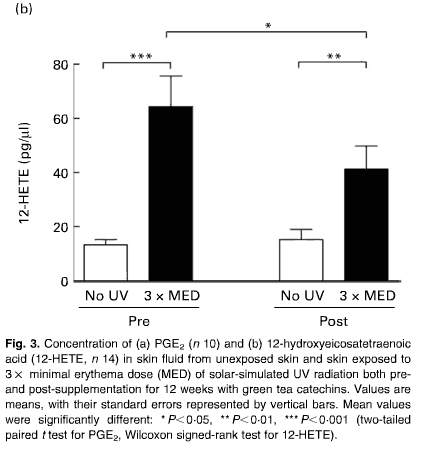 Post supplementation reddening of the skin was about 20% lighter with the same UV exposure. These aren’t exactly mind-blowing results, and you certainly shouldn’t rely on green tea for sun protection, but this does show green tea can protect against acne-causing inflammatory damage. Here’s another graph that shows levels of 12-hydroxyeicosatetraenoic acid (12-HETE) in the skin. 12-HETE is an eicosanoid, a molecule that signals inflammatory damage. The higher the 12-HETE levels are the more inflammatory damage the UV exposure caused, in a nutshell. Pre supplementation 3 x MED dose caused almost 5-fold increase in 12-HETE concentration in the skin, as compared to non-exposed skin. Post supplementation the same increase was only 2.7-fold. Eyeballing from the graph (the paper didn’t give exact figures), post supplementation there’s almost 40% reduction in 12-HETE as compared to pre supplementation. 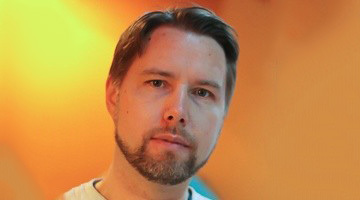 Heinrich et al. did a similar study with light-skinned German women. 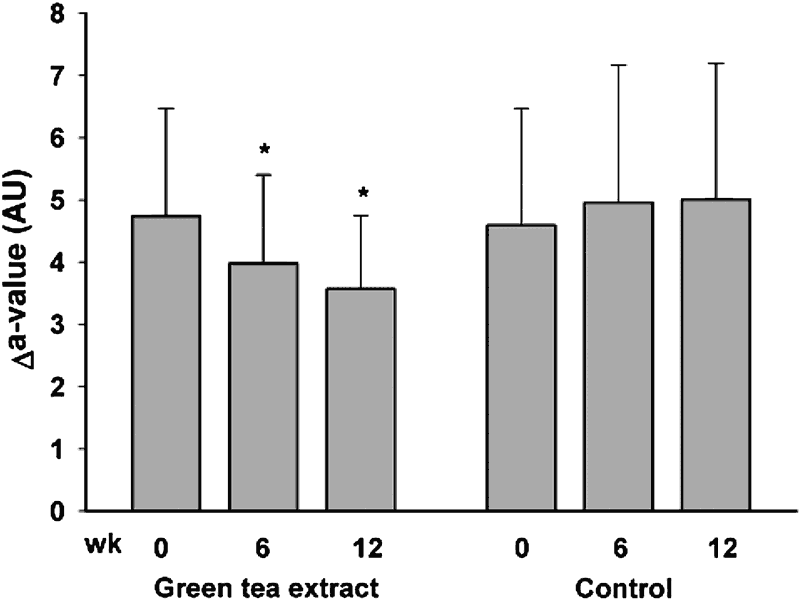 In this study the participants received either a green tea beverage containing 1402 mg catechins (with 960 mg of EGCG) or a placebo beverage with no catechins. They drank the beverages daily for 12 weeks. This graph shows sensitivity of skin to UV radiation for the green tea and control groups. 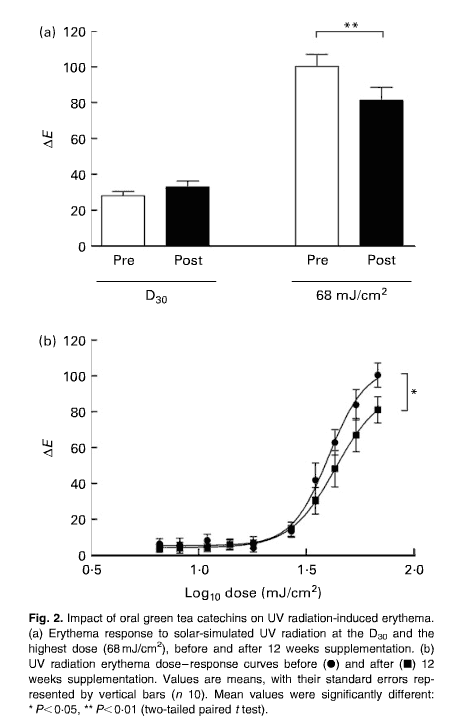 Higher bars indicate more skin reddening in response to 1.25 x MED dose. There was 16% and 25% less reddening in the green tea group after 6 and 12 weeks, with no change in the control group. The results also showed general improvements in skin health, with 17% increase in hydration and 12% improvement in the skin barrier function for the green tea group and no change in the control group. These studies provide direct evidence that green tea antioxidants are able to enter the skin and affect the molecular mechanisms behind acne. Given how antioxidant supplements , topical antioxidants and topical green tea have been shown to reduce acne, I’d say it’s very likely these findings translate into improvements in acne. Green Tea Polyphenols Provide Photoprotection, Increase Microcirculation, and Modulate Skin Properties of Women. Do you think drinking a cup of organic decaf swiss water processed coffee is harmful? I drink green tea and love it, but I always want my first drink of the day to be coffee…I also read that coffee may mimic gluten (which I have a sensitivity to right now). I am currently trying the GAPS diet to heal my gut and hopefully my adult acne:) Also wanted your thoughts on insulin in tea from the caffeine. Would that possibly cause breakouts (was it recommended to drink 4-5 cups a day)? Have a great weekend! No, there’s no harm in drinking coffee (in moderate amounts). I’ve never hear of coffee mimicing gluten. It sounds like a load of nonsense to me. Caffeine has a temporary negative effect on insulin, but the overall effect of coffee and tea are positive. So it’s not something I would worry about. Do you think taking these tablets would be as good as drinking green tea? Should be ok based on the label. One serving seems equal to 3 or 4 cups of green tea. Nice indeed, but i read somewhere that green tea raise up the DHT concentration and thus, increase acne..? That result was based on a single animal study. Don’t worry about it. Thanks for getting Clear for Life. Hope you find it useful and really appreciate your trust and business. But the mechanism of action of nettle root is actually,from what i read, to inihibit the formation of DHT but i read too it lower shbg concentration so i’m kind of lost too. I have vulgaris acne and i dunno if playing on my hormones are a good thing but i suffer from acne since 5 years now so i’m desesperate. Do you have any sources for this? It’s hard to comment on it otherwise. The problem is that often these kind of claims are based on animal studies or otherwise preliminary research. Most people don’t know what they can and cannot conclude from a scientific study. So when they see a cell culture or animal study ‘showing that green tea increases DHT’ (as an example), they go ballistic on forums spreading this ‘knowledge’. By the way, i start today to read your book, hope it will help me out with acne. I discussed this study in another comment in some other post (don’t remember where now). Yes, green tea seemed to increase DHT production, but the values are not statistically significant, the p. values are above 0.05. Normally this would be classified as negative or null study. Furthermore, this was done using an animal model. Can’t say what’s the case here, but animals used in animal models of human diseases are often bred/modified to be extra sensitive to inputs. It’s not at all clear that the same would happen in humans. I wouldn’t worry about this. Would white tea be better? I read that it’s the same plant as green tea, just that it’s less processed, retains more antioxidants, and less caffeine. I looked into this when I wrote my first tea hacking post. There’s not much research on white tea as apparently what exactly is white tea isn’t well defined. The studies I did found showed that white and green tea had similar antioxidant levels but, surprisingly, white tea had more caffeine. I can’t say how universally applicable those results are though. Hi Seppo.. Hope you are doing well.. I am not sure where I should be posting my general questions but I just wanted to ask you a few things and touch base.. it has been a few weeks since I got your book and became gold member.. I purchased the NAC supplement from now and have been taking 2 a day like you advised.. along with 25 mg of zinc. I have also implemented your skin care routine suggested.. and of course diet which I had already been doing .. I am being very patient but have not been seeing results really.. I still get new pimples, its really frustrating.. I wanted to ask you how long it takes to see results with the supplements? I want to give you an over view of the other supplments I’m taking as well so hopefully you can give me better guidance or if there’s anything you think I should add.. In studies it usually takes 3 to 4 weeks to start seeing results and 8 or so weeks to see full results. If you haven’t seen any results, then there could still be some internal issue that’s messing up your skin (or it could just be your genes). I’d say if your acne is to the moderate/severe side, then there’s probably some internal issue, but if you only get mild acne, then it may be just genes. In my case, my skin remains very good as long as I don’t do anything to upset my gut. But if I get gut problems, then all the skincare and supplements are worth nothing. Regarding supplements and things you take, here’s where me and Tracy differ a lot. My frank opinion is that most of the supplements and things you take are just waste of time and money. There’s no good evidence that you need to support your liver of cleanse your blood or anything of the sort. The few supplements I recommend are the only ones that have any evidence or plausibility to help acne. It’s hard to say much without knowing more about your situation. I’m going to start a Q&A section on the site. I planned to wait until the site redesign is finished, but I can set it up already sooner. Let’s say that I promise to get it up and running this week (there are some technical hassles I gotta figure out). Can you a few days? I think the Q&A section would be a better place to have this discussion. Okay I will wait for that.. so then you will answer my questions regarding antioxidant and if NAC is same thing as live -tox… ? and the few other things I have asked? Yes I understand where you and tracy differ that is why I wanted to ask you about the differentiation with liv-tox and nac through your opinion .. because I too believe that scientific evidence can help us best instead of playing the guessing game. will i have to repost my questions? if there is anything else you can recommend that i can start implementing immediately please let me know..
regarding gut issues. i take probiotic which helps me have a bowel movement once a day when before it was once every few days.. I think my gut is doing good ever since I started probiotic.. what else can I do to even help it more? As in, my point was that I don’t think the liv-tox and many other supplements you take do anything. Liv-tox does have sillymarin, so it can act as an antioxidant, but I don’t know whether it’s present in sufficient amounts. Anyway, both NAC and sillymarin are antioxidants, and my guess is that taking one is enough. I doubt that their effects are additive. I covered EstroBlock and probiotics in another posts, but can’t really say anything about the other supplements you take since I haven’t looked into them in detail. I’ve been looking into berberine recently and it seems really promising. It’s been shown to reduce insulin resistance and I just found 2 studies showing it can be effective in PCOS, meaning it’s probably helpful in female hormonal acne. I’ll write more about in the post I promised (coming in a day or two). For gut issues, please refer to the section in Clear for Life where I shared some ‘tools’ for figuring out if you have gut problems. I didn’t even realise I have gut issues until I started paying attention. What green tea brand do you use when brewing green tea? Just something I get from a local supermarket here. It has Japanese characters in the package that I don’t understand and look cool 🙂 I don’t buy the most expensive brands as ‘hacking’ anyway destroys the taste. The things I buy are towards the lower end of the price range for loose leaf Japanese green teas. Do you know if drinking (non-alkalized) hot cocoa (said to have at least 2 x more antioxidants than green tea), will work towards clearing the skin also? There are lots of online references for this, such as these; https://www.sciencedaily.com/releases/2003/11/031106051159.htm. https://pubs.acs.org/doi/abs/10.1021/jf0344385. I like green tea and drink it anyway, but I am wondering if hot cocoa is another good option? Cocoa could have both positive and negative effects on acne. Positive because of the antioxidants, but there’s also some research suggesting that cocoa itself causes acne. At the moment it’s impossible to say what the net effect will be, but I would be careful with cocoa. Would taking an EGCG supplement deliver the same result as drinking the tea? If the supplement actually contains what it says on the label, then supplement would deliver at least some of the benefits of green tea. Many of the studies actually used supplements instead of tea as it’s easier to standardize dosage that way. Doesn’t Green Tea speed up your metabolism? I do t have any weight to lose and am currently trying to gain a few pounds. I see the benefit of drinking it but will it make me have to eat even more calories? No, green tea has only very small effect on metabolic rate or weight. The claims that green tea causes weight loss are mostly hype. In blinded studies people taking green tea vs. not taking show there’s almost no difference in weight loss between the groups. I never had any benefit from drinking green tea on my acne. And I drank a lot of tea for a long long time. Also topical it didn’t do anything to my skin. But I will give it another try. Buy really good quality and just put it on my face. Do you just steep green tea and put the tea on your face ?Or do you make some kind of mask with the leaves ? And how often do you do it ? Do you have any scientific information on herbs and their effect on acne and other skin conditions ? Are their herbs that proven to be good for the skin besides Camellia sinensis ? I have a post here about DIY topical green tea, please see that for more. As to herbs, there is some data to support a handful of herbs. Please use the search function and you should find the posts. hi seppo, how long before i see a difference on my acne when drinking green tea. one week?4 weeks?how long before i know that it dont work? I can’t promise it will help your acne. It may, but it’s not a guaranteed treatment. I’d say give it at least 4 weeks to see some effect. Hello, I’ve been incorporating the advice on drinking green tea and read the part of the book about putting sugar into the tea to increase the availability of catechins, but I have been avoiding all refined sugars and sweeteners as part of my quest for clear skin. Do you know if honey is just as effective? If not, how much xylitol was used in that other study mentioned? Do you think stevia would work as well? Thanks! Honey is basically just sugar, so I would assume it works too. In the study they used 3 xylitol doses 200, 500 and 1000mg. Higher doses increased bioavailability better than lower doses. I can’t say if stevia would have the same effect since I’m not sure what’s the mechanism that caused the increase. hey…does green tea cause constipation…and if so..wouldnt it make acne worse? I don’t know. It doesn’t cause any problems for me. What type of green tea would you recommend to drink?? Is Matcha green tea powder better than tea leaves? Also, on an un-realated topic – do you think it is possible to have hormonal acne even though I have low hormones? I had a blood test done & all of my hormones are low (male & female hormones) – like abnormally low. I am female btw so I guess my testosterone should be low but I thought that high testosterone caused acne?? I recommend drinking loose leaf or powdered green tea. They usually have the higher EGCG content. Matcha is also OK. I’m not convinced that matcha is that much better than other high quality green teas. Most women with acne have hormones at the upper end of the normal range. I haven’t heard of a case like you where all the hormones are abnormally low. That would suggest something other than hormones is the main cause for your acne. Though I suppose it’s possible your skin is just very sensitive to the hormones. Or that your estrogens are much lower than androgens and aren’t enough to balance the effect in the skin. Do you have other signs of hormonal acne? Like breaking out after sugar or dairy? Breaking out before periods? 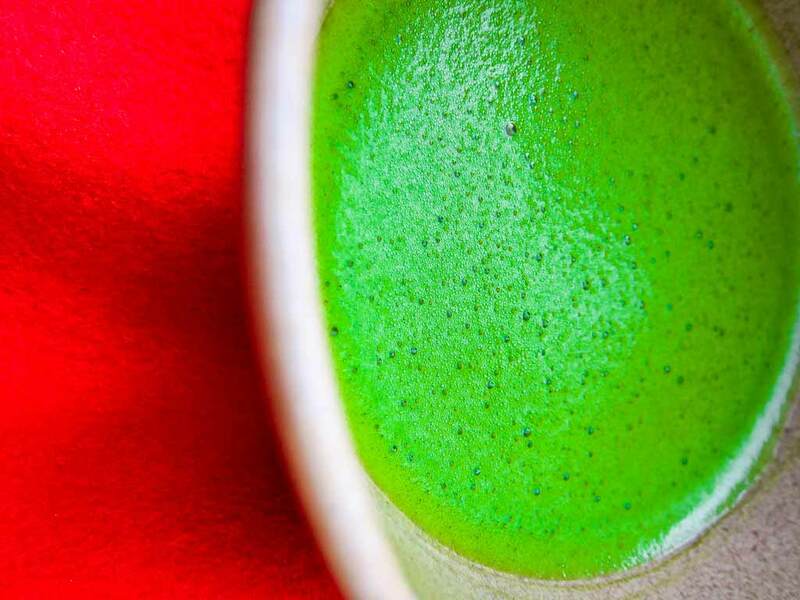 To maximize the benefits of matcha, does it have to be mixed with boiling water? I usually just mix it in with cold water for convenience but I was wondering if that doesn’t release all the potential antioxidants. Thanks! I don’t know for sure. I’m sure that the antioxidants in the ‘liquid’ portion of tea will be absorbed better than the ones in the matcha powder. Hey Seppo! I really appreciate your work. I want to thank you for your research-based approach. I am indebted to you 🙂 It’s really made me reexamine a lot of things and has given me a lot of food for thought. So I’m ditching the ACV (so dumb lol) and I’ve been trying a lot of green tea. I’m extremely excited to see how it helps. I was actually wondering, what do you think about rooibos tea? I prefer rooibos tea over green tea. Nowadays, I rarely drink green tea. I cold-brew rooibos overnight to have with breakfast. I can’t say whether it’s as effective as green tea for acne. Rooibos has a lot of antioxidants, but we don’t know whether the acne-fighting properties of green tea are due to the EGCG catechin or a general antioxidant effect. I suspect that both are good for the skin.